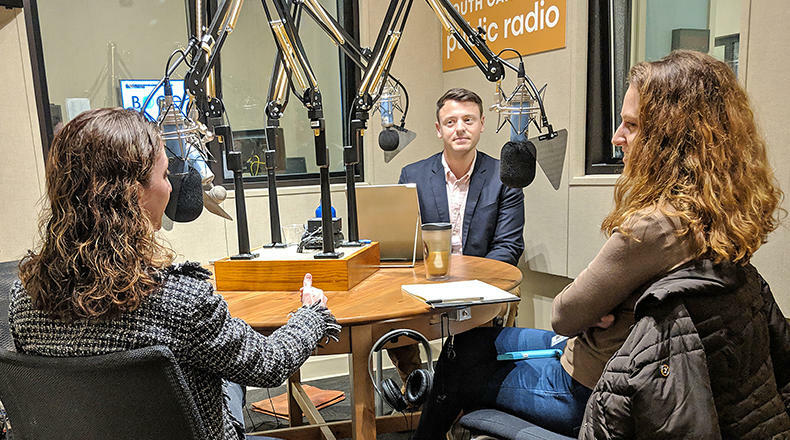 Gavin Jackson speaks with Seanna Adcox (l) and Maayan Schechter (r) in the South Carolina Public Radio studios on Monday, March 4, 2019. On this episode of South Carolina Lede, host Gavin Jackson is joined by The State's Maayan Schechter and The Post and Courier's Seanna Adcox to discuss the education reform package hitting the floor of the South Carolina House of Represenatives this week for debate. The bill is one of the most sweeping proposals to address Palmetto State education issues in years and could make it to the state Senate by the end of the week, where a similar companion bill continues its way through the committee process. Then, South Carolina Public Radio's own Russ McKinney stops by to quiz Gavin about South Carolina history in this week's Did You Know segment. You can subscribe to South Carolina Lede in Apple Podcasts, Google Play, Stitcher, and Spotify. You can also follow the show on Instagram and Twitter. On this edition of South Carolina Lede, recorded live at T.W. Boons in Greenwood, SC, host Gavin Jackson is joined by The Post and Courier's Jamie Lovegrove and The State's Maayan Schechter to discuss the growing list of Democratic presidential candidates and their visits to the Palmetto State as they vie for their party's nomination in 2020. Work is underway at the Statehouse on next year’s $9 Billion state budget which is expected to pump money into reforming the state’s public education system. Gov. McMaster sent his budget recommendations to the legislature this week. He calls for a 5 percent pay raise for teachers at a cost of about $155 Million, $36 Million for colleges aimed at holding down tuition, and over $48 Million to put more trained police officers and mental health counselors in schools. After the first week of this year’s session, it’s clear that the top priority for the South Carolina General Assembly is improving the state’s public school system, something that education advocates have been seeking for years. In his Inaugural Address, Gov. Henry McMaster (R) joined legislative leaders in calling for what he termed a “bold" game plan to boost the state’s education system.